You may need to sync some essential PDF documents to your iPad to take along for easier access from time to time. There are several ways to transfer PDF to iPad, and we introduce five of the possible ways, including easy iCloud iBooks Dropbox solution requiring no USB cable, emailing way, iTunes way etc. Pick out the simplest way for yourself. The following ways are also applicable to import PDF documents to iPhone and iPod without data loss. Free download the all-around iOS file transfer and manager, MacX MediaTrans, to batch import PDF documents to iPad Pro/Air/Mini quickly from computer for easy access. No iTunes syncing, no file size limit. Many iOS file transfer applications are available for PDF files syncing to iPad easily without iTunes. Here we recommend you to use MacX MediaTrans, an all-in-one iOS file transfer and manager tool, which offers a hassle-free way to quickly transfer PDF files to iPad Pro/Air/Mini, as well as PDF, epub to iPhone in batch without iTunes sync. It's easier and faster than iTunes, and there's no PDF file size limits that you are facing when using iCloud Drive, Dropbox and email to import PDF documents to iPad. What's more, the iTunes alternative for Mac does more than PDF to iPad transferring. You can use the tool to move Books (audiobook, EPUB etc. ), music, video, movies, photos, podcast, and many other media files between iPhone iPad iPod and computer, edit/manage PDF files, music, videos, movies, photos and others for iDevice, remove DRM, convert file formats, to name a few. Follow the guide below to learn the specific steps. Step 1: Download the MacX MediaTrans or for Windows and open it. The tool supports the latest iOS 11 and macOS High Sierra. Connect your iPad to computer using USB cable. 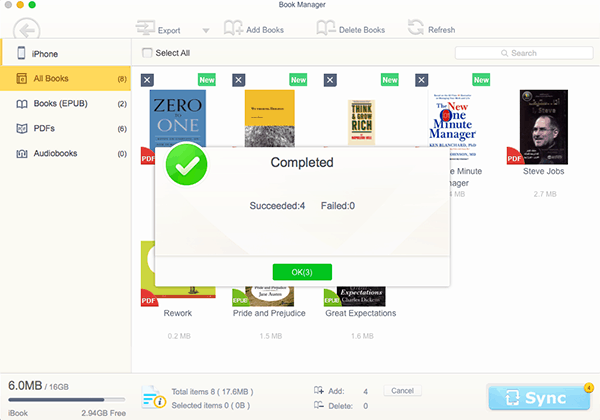 Step 2: Click Book on the interface and then click on Add Books of the Book Manager window. Select PDF files on your Mac or PC you'd like to transfer to iPad. The file transfer for iPad supports to import more than one PDF file at a time. You can delete PDF files you don't want to transfer from the list. Step 3: Click Sync button at bottom right, and the selected PDF files will be synced to iPad quickly. The iOS file transfer can import and backup PDF files, EPUB, audiobooks on iPad, iPhone, iPod to Mac/PC. These steps above are also applicable to transfer audiobooks to iPhone, PDF to iPhone on Mac and PC. Learn how to remove audiobook DRM and convert audiobooks to DRM-free MP3 format for unlimited playback and sharing. Step 1: Open iTunes on your Mac or PC. Upgrade your iTunes to the latest version if you haven't. Step 2: Before you start to transfer PDF to iPad, you should drop and drop your PDF files to the iTunes Library or to your iBooks library using iBooks for Mac. Step 3: Connect iPad to computer with iDevice USB cable. 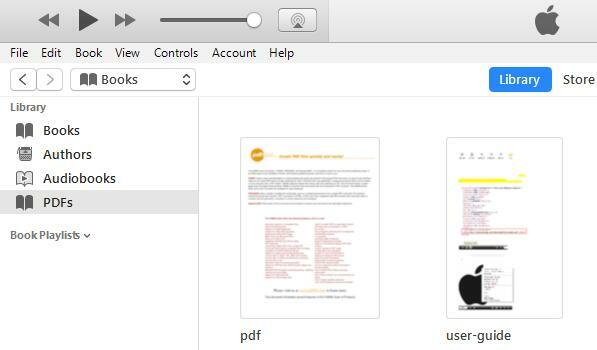 To sync a PDF from Mac or PC to iBooks on iPad, click "Books" under iTunes library on the left pane. Learn how to solve iTunes not recognizing iDevices. Step 4: Select Sync Books, select the PDF documents you want to sync to iPad, and click "Sync" to begin to add PDF to iPad using iTunes. You can set iTunes to sync all books or selected books. Step 1: Turn on iCloud Drive. Learn how to set up iCloud Drive after you update to iOS 11 or macOS High Sierra. 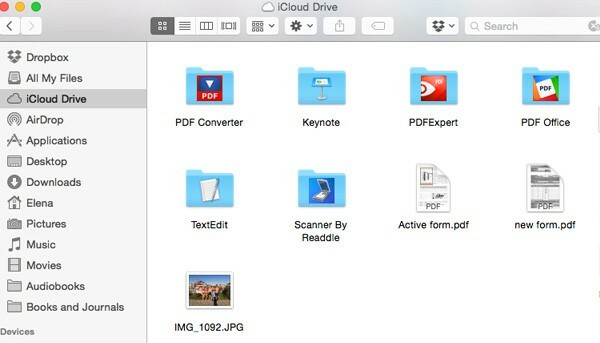 Step 2: All files including PDF documents will automatically upload to iCloud. PDF files you've added to iBooks library will also automatically upload the iCloud. Follow to learn how to free up space on iCloud if you don't have enough free storage. Step 3: Now you can download PDF files from iCloud Drive to your iPad. To do this, open iBooks, find the PDF file you want to access, tap the download icon and the PDF file will download to iPad. With iCloud Drive, you can add PDF to iPad without iTunes, be it PDF file on iPhone, another iPad, Mac, PC. The emailing way is a popular way to transfer small PDF files to iPad. But it is only suitable for small PDF files (not folders) transfer and requires Wi-Fi network each time you want to access to it. You have to back to that email every time and you may not able to open files on your iPad. Step 1: Login to your email account and send email with PDF files you want to transfer attached to yourself. Step 2: Login in to the same email account on your iPad. Find your PDF file attachments, click to download the PDF files to iPad. Dropbox is one of the easiest cloud solutions to transfer PDF files or folders to iPad and it gives a free 30-day trial. Step 1: Download and install Dropbox on PC or Mac and iPad. If you have installed Dropbox, it becomes much easier for PDF importing to iPad without iTunes. Step 2: Move PDF files into Dropbox folder on your computer for later transferring to iPad. Wait for the PDF syncing process is finished. The time it takes depends on your network connection speed and PDF file size. Step 3: Open Dropbox on your iPad and sign in. You'll see the PDF files on your iPad. Click on PDF files to open or click Open In button at the top right corner and select iBooks, and transfer PDF files to iPad's iBooks library. Free download the solid iOS file transfer and manager, MacX MediaTrans to easily and quickly sync PDF documents from computer to iPad Pro/Air/Mini running iOS 11 or iOS 10 or earlier for easy access without iTunes sync. Batch transfer, no size limit. For any questions with MacX MediaTrans, please feel free to contact our support team.